Disinfection, purge, cleaning, and deodorization of refuse collecting equipment, refuse trucks, refuse chutes etc. 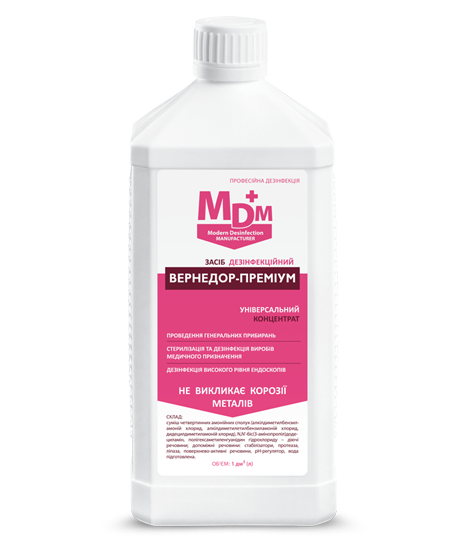 Mixture of quarternary ammonium compounds (alkyldimethylbenzylammonium chloride, alkyldimethylethylbenzylammonium chloride, and didecyldimethylammonium chloride) – 10 %, N,N’-bis(3-aminopropyl) didecylamine – 10 %, polyhexamethylenguanidine hydrochloride – 2 % (all of them being active ingredients), synergetic components and additives (protease and lipase enzymes, nonionic surfactants, isopropyl alcohol, pH regulating agents, and stabilizers), and specially treated water. The means has antimicrobial effect against gram-negative and gram-positive bacteria (including tuberculosis as well as hospital and anaerobic pathogens), viruses (all known pathogenic viruses to cause man diseases including those to cause enteral and parenteral [A, B and C types] hepatitis, HIV [AIDS], poliovirus, adenoviruses, atypical pneumonia virus [SARS], type A bird influenza [H5N1], type A swine influenza [H1N1], and human influenza, herpes, and so on), fungal infections (candidosis, dermatomycosis), and molds, and it has sporocidal properties as well.